Three candidates have emerged as the "top tier" in the Republican Party's primary for Governor this year: Charleston-area Republican activist Betty Ireland, Morgantown resident Bill Maloney, and State Senator Clark Barnes of Elkins. Each of the three has their respective strengths. Ireland has been around politics long enough to know how to deliver a good speech. In her set speech, given around the state, she likes to define herself as "tough and tested." By positioning herself as "tough," Ireland is attempting to show that she suits the times, which are increasingly tough. This is all good stuff in a GOP Primary. Republicans like some flint in their leaders. After all, wasn't it Richard Nixon who famously said that a President needed to have a little mean streak in him, if only to make his foreign opponents think twice about messing with him? The only problem is that Ireland doesn't know when to turn the toughness off. She is capable of being gracious, but just as capable of turning someone off with a put-down or a condescending remark--including fellow Republicans. This is unfortunate and is something Ireland should just get over. Otherwise, whatever genuine leadership capacity Ireland has will be held back. Bill Maloney of Morgantown is trying to make his first impression to the state's voters. As a businessman who has been able to retire early in life, he wants something to do and decided to try politics. Nevermind the fact that he decided to start at the top and run for Governor. Perhaps he has a skill set that he believes allows him to translate his business success to being a successful Governor, too. But Maloney is taking the completely opposite tactic of Ireland's toughness, or so it seems. In his first TV ad of the season, Maloney is anything but tough. Rather, Maloney gently says that he wants to be known as "reliable," like his reddish golden retriever who goes to pick up the newspaper every morning. But is Gentle Bill so nice that, as Governor, he would get gobbled up by the legislative leadership? Many folks increasingly wonder about that, since Maloney has never played politics in Charleston before. He then tells you exactly what he thinks, shooting straight, giving details, showing that he's prepared for the top job. Senator Barnes has the right kind of confidence--confidence in us, the people of West Virginia, and our future. He says that, if elected Governor, he won't waste money on every federal program that comes down the pike. He'd rather save the taxpayers' money, giving us a rebate if possible, and putting a higher priority on more meaningful local projects like roads and schools. A successful small businessman, Senator Barnes offers Republicans the business background that they like in Maloney. But he also has the strong determination they see in Betty Ireland. Plus, he's the most informed candidate on the circuit when it comes to the issues--and knows how to deal with the legislative leaders on Day One of his administration. What kind of dog would Senator Barnes be in comparison to Ireland's pit bull and Maloney's golden retriever? From what we see of him running around the state, cheerfully talking to voters at every stop, having perpetual energy, we'd say Barnes is West Virginia's rural border collie: smart, pro-active, focused, and likes people. 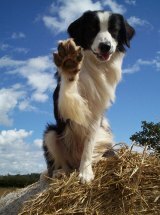 Wouldn't it be fun to see this border collie keeping those sheep in the legislature on task, nipping at their heels?